Get ready for a dynamic & balanced 7-day trip, customized for 27-32 year olds, leaving from DC. Don't miss out on this opportunity to travel with Israelis your age for the whole time & people from the District/surrounding areas. Now is your time to experience the sites, vibes, flavors, culture, history, & so much more of Israel! 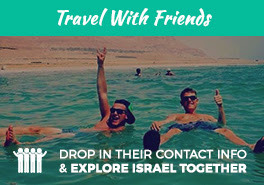 This brand-new experience is the perfect opportunity for you to explore Israel while making life long connections!